A little over a year has passed since I published The Law Firm C-Suite Study, a project which examined the relationship between the existence of various C Suite positions and the profitability of a law firm. 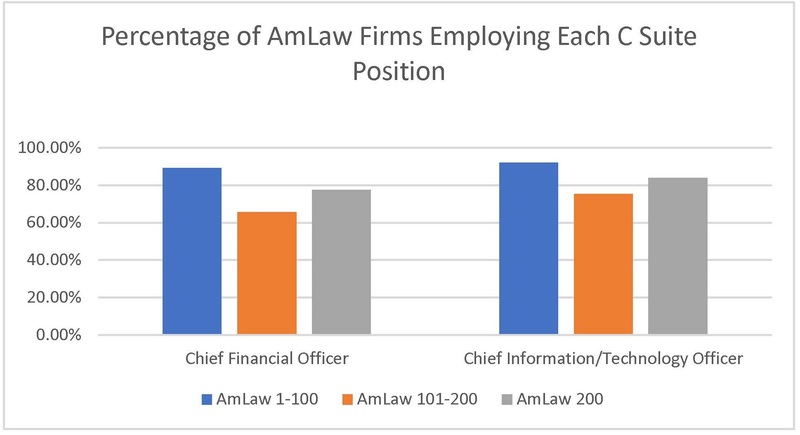 In that study, I surveyed 128 AmLaw 200 law firms as to which C Suite positions they employed. I then ran regressions on those responses against the self-reported revenue and profitability data collected by AmLaw. The conclusion of last year’s report was that law firms run by a group of highly skilled professionals reporting to the shareholders of the firm generally enjoyed increased profitability as compared to firms that did not build out a C Suite. Note, this is correlation; not causation. The three positions that were found to be most directly tied to greater revenues were Chief Financial Officer, Chief HR/Recruiting Officer and Chief Technology/IT Officer. Specifically, firms with a Chief Financial Officer reported an average of $350,000 higher profits per equity partner than firms without someone in that position. Firms with Chief HR/Recruiting Officers reported an average of $356,000 higher PPEP than firms without someone in that position. Finally, firms with a CIO/CTO reported an average of $209,000 higher PPEP than firms without someone in that position. First, with respect to the 128 firms surveyed last year, eight that did not have CFOs last year have since hired someone for that position. Five firms that did not have CIO/CTOs have since hired someone for that position. The data also indicated, solely with respect to the Chief Financial Officer position, a correlation between the existence of the position and higher PPEP. Specifically, firms with a CFO averaged $228,492 higher PPEP than their counterparts without a CFO. This year, the correlation between the existence of a CIO and higher PPEP was not meaningful, perhaps because such a high percentage of firms employ a CIO. Why did some firms add CFOs this year? To better understand why firms might have added the CFO position this year, I reached out to some experts in the legal C Suite recruiting world. Amanda K. Brady, Global Practice Leader for Major Lindsey & Africa’s Law Firm Management practice, and her team helped several AmLaw200 firms hire CFOs and CIOs over the past year. I asked Brady specifically about firms that hired someone for one of these positions for the first time. Brady said that many firms have very capable and competent people in financial management roles who have occupied those roles for a significant period of time. Traditionally, in such firms, that financial management role has been referred to as a Controller or Director of Finance/Accounting. When these individuals eventually retire or move on to other positions, the firms will re-evaluate what the role should look like going forward and consider whether the title should evolve accordingly. Brady said that alternatively, some firms employ a Chief Operating Officer or Executive Director with a finance or accounting background to handle the responsibilities typical of a CFO. Usually this is the case in firms with a managing partner or executive committee that takes on more of the operational and administrative responsibilities. In those instances, when the COO leaves or the managing partner responsibility transitions to an individual who prefers a more strategic and less administrative role, a firm may hire a COO to handle firm operations and administration and add a CFO to handle financial management and strategy. Michael Shackelford, Managing Partner of legal C suite recruiting firm LRG, LLC, recently worked with a firm that was looking to replace a finance director who had left the firm. This firm decided that the person they were looking for needed to be a strategic thinker: someone who could talk to both the firm’s lenders and the firm’s clients. Consequently, they changed the responsibilities and corresponding title associated with the role to Chief Financial Officer. Why are firms adding CIO/CTOs? Per Shackelford, his company is seeing firms hiring CIOs/CTOs upon the realization that they need an individual to lead the firm’s technology strategy, not just to manage and ensure the continuous operation of existing technology. While legal industry experience is not always a requirement, Shackelford said that legal industry experience is desirable because often firms want a candidate who knows what is happening on the cutting edge of legal technology and who understands the idiosyncrasies of the industry. Why are firms adding Chief Marketing/Business Development Officers? While I can’t correlate increases in PPEP to the CMO/CBDO position, it is inarguably a growing role in the legal industry as firms realize the benefits of developing sophisticated business development capabilities. Calibrate Legal specializes in recruiting for legal marketing and business development positions as well as HR, recruiting and professional development roles. I spoke with Jennifer Scalzi, Calibrate’s founder and CEO, about the trends she and her firm are seeing in recruiting for such positions. Scalzi says she has seen an uptick in searches for practice group directors. She describes this role as a person who manages and develops client relationships and reports to the chair of a practice group. Ropes & Gray and Cooley (among others) employ people in these roles. Scalzi said the individuals performing this practice group director function are often former practicing lawyers. The practice director role frequently has an associated practice group marketing manager with whom the practice director works to formulate and execute on practice group business development strategy. Brady is also seeing an increase in the number of practice director positions across firms of all sizes. As an example, she cites Kilpatrick Townsend which employs business people who report to practice chairs and function as practice group COOs. Similarly, per Chief Strategy Officer Mark Usellis, Davis Wright Tremaine supports all of its practice group chairs with practice group directors. DWT’s practice group directors’ responsibilities include growing the practice groups’ businesses, saving lawyers time and helping the chairs do their jobs better. Scalzi stated that as generations shift, firms are taking a close look at infrastructure and often consolidating HR, attorney recruiting and professional development responsibilities under a Chief Talent Officer. This person is responsible for all of the people assets of the firm — both attorney and business staff. What other business roles are growing? Per Brady, there is a lot of conversation around pricing professionals and project management professionals, however, the greatest demand is for those individuals who have the skills to integrate pricing with project management. The majority of the ten+ COO searches Shackelford and LRG completed last year were necessitated by the retirement of a firm’s existing COO. In all of these placements, the firms hired professionals with legal experience. Compare this to the searches Shackelford completed for Chief HR Officers, Recruiting Directors and Directors of Attorney Development. For those positions, Shackelford said law firms consider and often prefer candidates from law schools or government. Brady and her team have placed candidates who hail from industries outside of legal in COO and CFO roles. In those instances, the candidates were equipped with impressive technical skills and experience coupled with highly service-oriented backgrounds that translated well to the law firm environment. For instance, MLA helped Davis Wright Tremaine hire former Providence Health Services CFO David Delafield to be DWT’s CFO. Scalzi says that 100% of her clients consider candidates outside of legal for the HR and marketing/BD roles for which Calibrate recruits, but few are ultimately willing to take the perceived “risk” of hiring such a candidate. Per Shackelford, in three CFO searches completed last year, two of the firms were willing to consider applicants from outside the legal industry, although professional service firm experience of some kind was a requirement. That said, the candidates placed are almost always CPAs. The most successful AmLaw 200 firms continue to be those that have evolved from being partner-run to being run by a group of highly-skilled professionals reporting the shareholders of the firm. The data collected from my follow-up survey continues to indicate that this model is generally conducive to increased profitability for the firms that adapt it. Law firm that recruit professionals with diverse professionals backgrounds benefit from cognitive diversity: the inclusion of people who have different styles of problem-solving and can offer unique perspectives because they think differently. If your firm is not already contemplating professional management, maybe it’s worth considering. [i] Author note: While I would like to have looked at similar data for the Chief HR/Recruiting Officer and Chief Marketing Officer positions this year, I found that there was too great of a disparity in titles and responsibilities between firms to garner meaningful data. For instance, some firms have a Chief Talent Officer, Chief HR Office, Chief Recruiting Officer and/or Chief Diversity Officer. Further, some firms use these positions to manage all employees – both business and professional, whereas others use these positions solely to manage attorneys. A similar problem arises with Chief Marketing/Business Development/Client Service Officers. [ii] “Teams Solve Problems Faster When They’re More Cognitively Diverse.” Reynolds, Alison and Lewis, David. Harvard Business Review. March 30,2017.